Many homeowners like to add luxurious outdoor features to their properties such as custom pools and spas. These are leisure features that add to the value of your home and create the kind of spaces where you can relax with your family and friends. 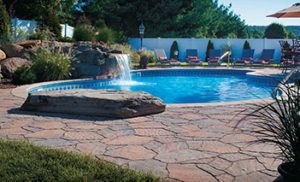 When you are getting this design and installation work done, you need to ensure that you hire a good custom pool designer for the job. Over the years we have handled a large number of swimming pool installation and spa design projects and have the expertise and skill to tackle these large tasks. We understand that the outdoor spaces see a great deal of wear & tear and that is why we focus on using materials that will be weather-resistant and hardy enough to withstand the Massachusetts winters. Our designers work very closely with you and understand what your ideas for your space are. They then create swimming pool design plans that have these ideas incorporated into them. Whether you want a luxury spa installation or a fantastic eternity pool, we are the company that can handle this job with the highest levels of expertise. You will find that our tiled spas are stunning in appearance and that they are highly functional too. Our designers can create the kind of personal getaways, secret haven, or personal sanctuary you want, right there in your backyard. You will also find that all these outstanding services and high quality materials are designed to fit within your budget so there won’t be any surprises down the road. Regardless of whether you want us to design a custom landscape for your whole backyard or simply want a swimming pool designed or a spa installed, we at Ivy Studio can help. Get started on your landscape design project today to have a beautiful custom spa swimming pool designed and installed, or take a look at our other landscape design services we offer to the greater Boston and Massachusetts Bay area.